"In this work of nuanced complexity, Taylor reminds us that at its best philosophy is a supreme form of cultural criticism aimed at both slowing and making visible the currents of thought defining the eras in which we live. With that in mind, he turns his attention and ours to President Obama as the embodied nexus of both racism and racialism and our desire to move beyond both. This is not fast food, but a slow cooked meal with ideas that are fresh, deliciously rewarding and satisfying." "With dusk having descended on the ‘Age of Obama,’ the owl of Minerva brilliantly takes flight in Paul Taylor’s scrupulous, deep thinking, and richly insightful essay on a presidency widely believed to be ‘post-historical.’ On Obama is publically engaged philosophy at its best: analytically astute and gracefully written, it invites us to take seriously the intellectual impulses behind the idea that the Obama presidency has been a genuine harbinger of ‘change.’"
"The Obama presidency calls out for serious philosophical reflection. With intelligence and eloquence, wit and wisdom, Paul Taylor has answered. In this thoughtful, wide-ranging, and accessible meditation on the historical and normative significance of Obama, he pushes us to think more honestly about race, pragmatism, and empire at this unexpected moment when the most powerful political leader in the world is black." This short volume is heavily focused on racial and postcolonial theory not readily understood by general readers or most undergraduate students. 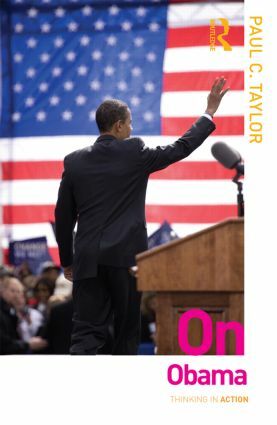 It will mainly appeal to fellow academics who share Taylorâ€™s philosophical and theoretical orientation. Paul C. Taylor teaches philosophy and African American studies at Pennsylvania State University, USA.